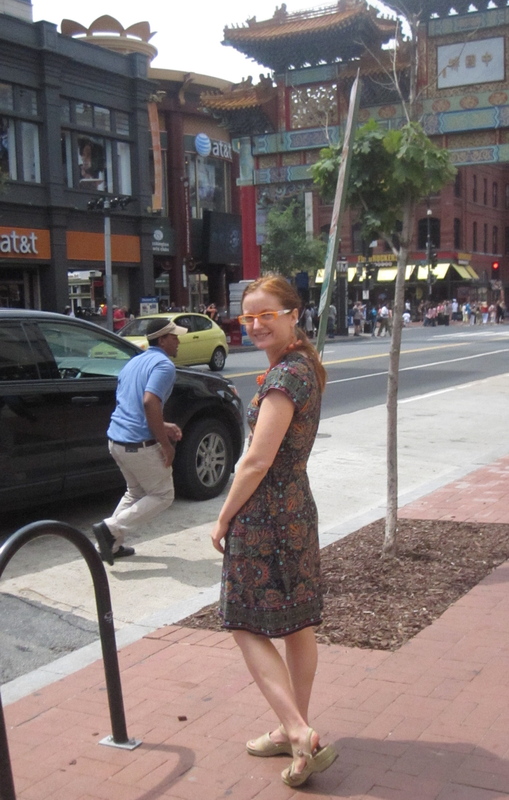 I've been meaning to get back to Simplicity 2369 (which they have issued as a seemingly identical pattern in the Amazing Fit line as 1653) for a while--it is just so flattering, and also fabric-economical compared to a full wrap dress. I had made it with the longer flutter-esque sleeve, as well as self-drafted long sleeve, but I wanted to try the cap sleeve version. 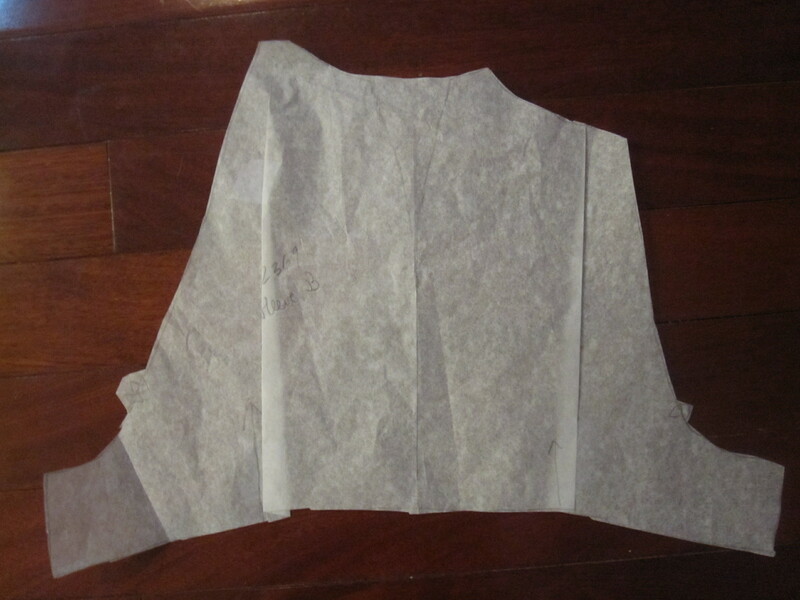 The sleeve is drafted as a two piece, with a front and back sleeve and a seam all the way down the shoulder. I combined these into one, lining up the seam line at the hem and using a dart at the shoulder where the seamlines diverged. After the dress was made, the sleeve was much floppier than I expected. It's shown on the line drawing as a cap and I feel like on other people it looks snug, but mine wings out a bit. I took some width out at the hem for next time, as you can see in the tucks at left. I shortened the crossover a smidge, shown at right. On the previous versions I found the crossover went all the way to the side seam, so the knot bulges out right at the side seam, widening my waist. Shortening it slightly moves the knot into the front so it doesn't add any visual width. The only other change I made to the pattern was to attach the tie to the left side seam (the side the crossover is attached to) so that it goes across the back. The pattern is drafted so the tie comes out the right side to just meet the crossover. This creates way too much weight in one place, and with the crossover a smidge too long just does not work at all. Not to mention, you lose that nice little bit of swayback fitting! I actually went back to the pink version, cut a longer tie out of leftover fabric, and sewed it into the left side. 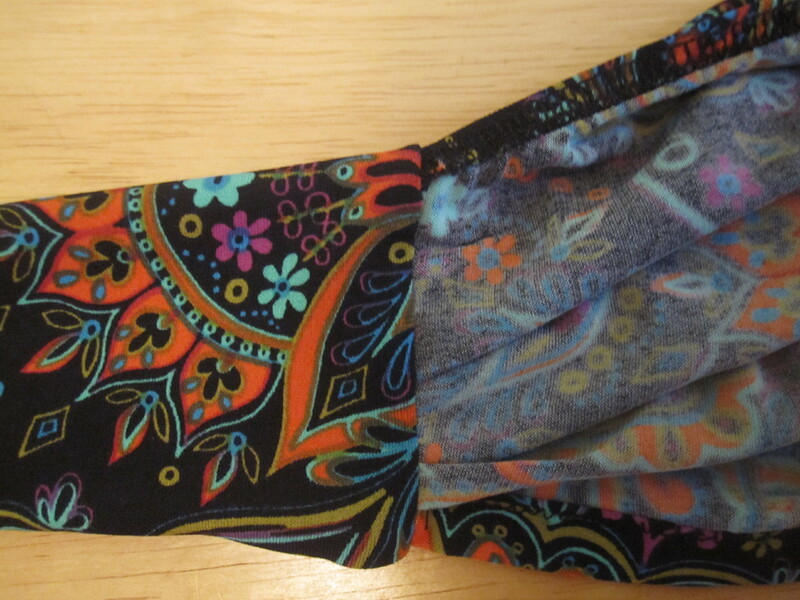 It's hard to see in the busy print, but the tie goes across the back in this version as well. I used the tie finish on the crossover described in my first post about this pattern. It neatly encloses the raw edges. For the neckline, I serged on very slightly stretched clear elastic then turned under and twin needled. I really like the way this pattern works in a border print. 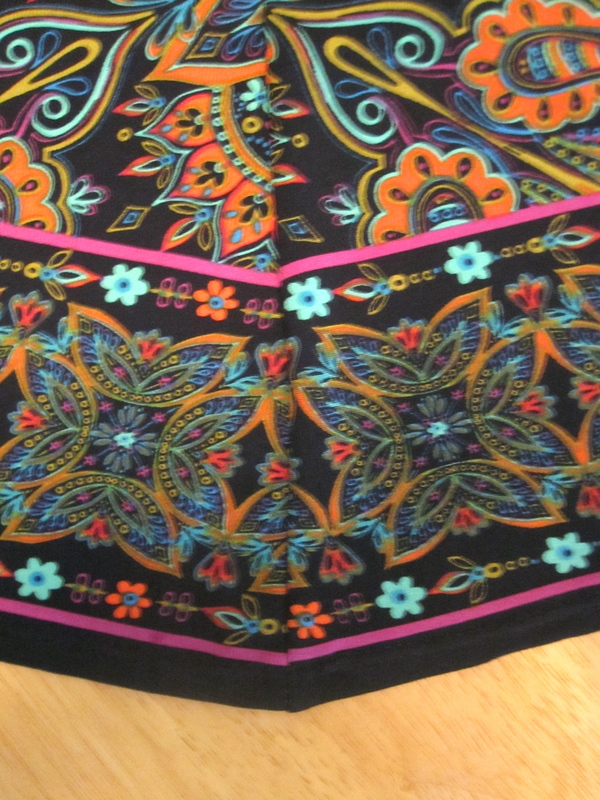 The skirt is not completely straight, so the border comes to a slight peak at the side seam, but it is really not noticeable unless you get this close. 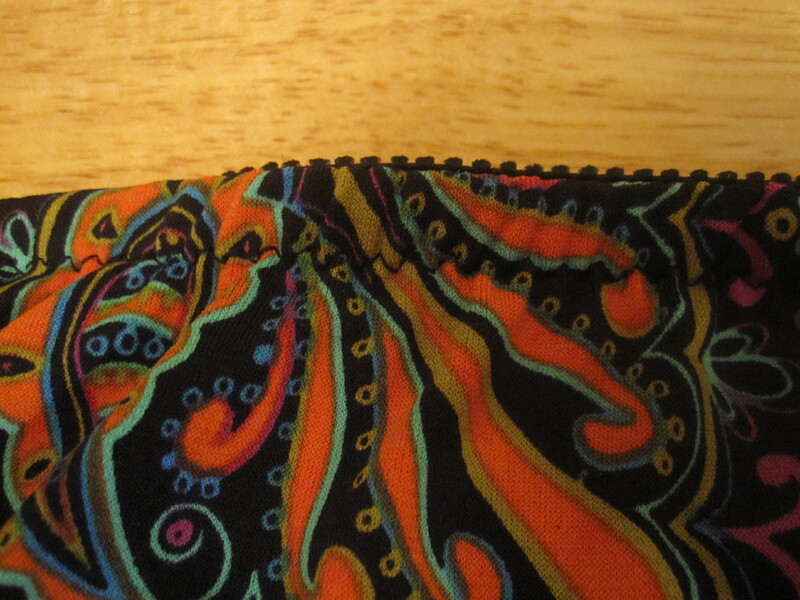 In addition to using the border at the hem, I cut the sleeve hems on the border. The detail is pretty much lost in the busy print in wearing, but I know it's there. I cut the ties with the border at the bottom for added visual interest. You might recognize this fabric from my impromptu Gulf Coast bikini. I was afraid I had screwed myself by cutting into it--the motifs are huge and really need to be centered--but luckily I had just enough to make this dress. I even had enough fabric left over for two pairs of knickers. I used the plush back picot elastic Ms. McCall of Brown Paper Patterns sent me for the waistline. I love it! Knit dresses are so easy that it feels like cheating when they turn out so flattering. Maybe I'll just call it "efficiency." 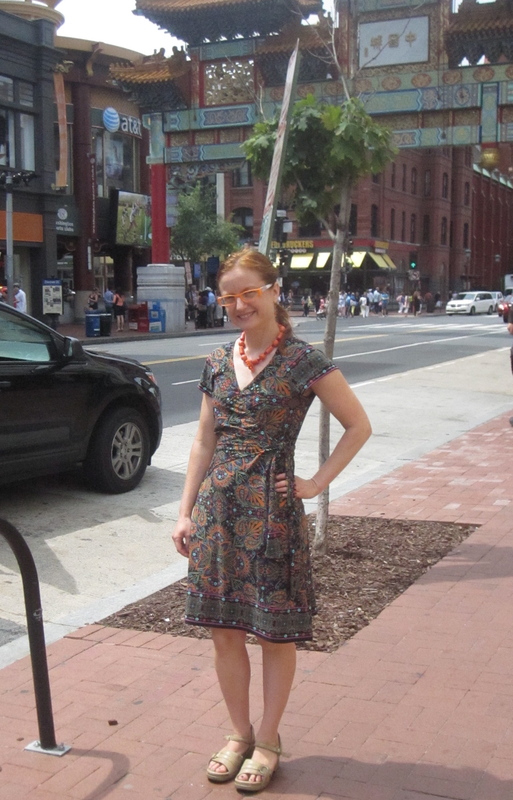 I got several unsolicitations from strangers when I wore this for the first time, in addition to kind compliments at the DC PR meetup (and an outdoor photo session!). Even the boyfriend spoke approvingly of "that psychedelic thing" (yes, this was meant as a compliment). I'm likely to be sparse for the next month or so. I had been planning a trip to the Greek islands at the end of September, but last week we spontaneously decided to move it up to the beginning of September. Yay, but eep! I have so much sewing to do! I have one bathing suit done, another cut out, and a pair of shorts cut out. The goal is to get those, a nightgown, a knit dress, and possibly a pair of yoga/hiking capris done in the next two weekends. Um. There will be more sewing than blogging going on, or at least there better be! And then I'll be on the trip itself, which I'm thinking will be sheer bliss. This version is really good on you. I like the sleeves. I don't think it would give as much movement if they were tighter at the hem. If you ever go through Heathrow on your way somewhere in Europe and have a layover, I could go meet you! I am about 30-40 minutes away. hey, you could even make it a longer layover and see London. We often have guests here. I like that description, efficiency, in regard to knit dresses, so true. Very cute dress and probably great for travel. what an exciting trip. That print is so perfect - what an absolutely fab dress! Great alteration to the sleeve. And the undies - so cute! I LOVE this pattern. I made a top from it about 3 years ago and have been meaning to get back ever since. This is most definitely my favorite version of this dress on you! I think your changes were spot on. How exciting about your trip - if you are going to Rhodes or Santorini feel free to pick my brain! I like this version the best. I think it is very flattering and the fabric does indeed rock. The trip sounds wonderful. Good luck with getting the sewing done. Very cute dress too! This is lovely on you. 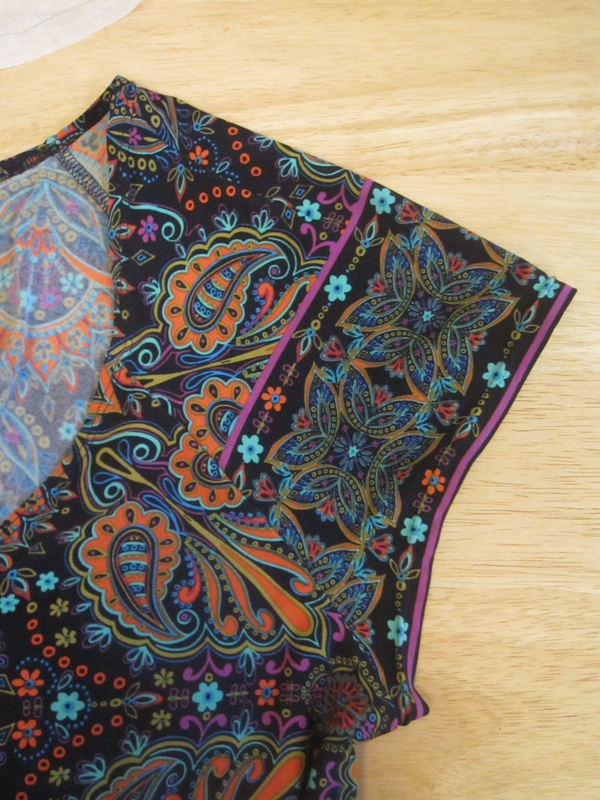 I wouldn't describe the fabric as psychedelic at all, it's very cool. I'm envious of your trip to Greece. I look forward to seeing your new 'makes' for the trip. This looks fantastic! Love the fit and the fabric. I think the changes you made are great - I will have to try them when I make this pattern again. This dress is fab and looks so great on you. So "efficient"! Good luck with your sewing done and have a nice time in Greece. 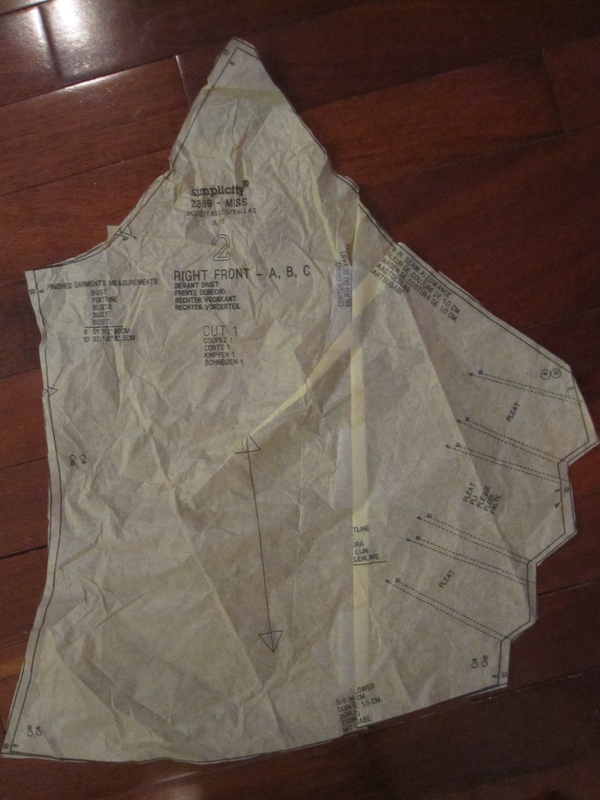 That is one of my favorite Simplicity patterns of all time. Your dress looks fabulous! Thanks for all the tips. I hope to make this pattern up soon and I'll definitely come back to this for help. These colors are fabulous on you. Love the dress, the necklace, and the orange glasses! Love this! I can easily see why you got so many compliments! Hope you have a great vacation! I've been reading your blog for five years and this is just one of the cutest things you've done. Great job! the colors and print size super SUPER suits you. Just FANTASTIC! Super cute travel perfect knit dress. I always enjoy my visits to your blog. It's been awhile since I was able to spend some time checking out your new creation. You never disappoint. Keep doing what you do and thank you for always showing the details. That pattern looks way better on you than it did on me (that crossover bit just bulged out over my already bulgy tummy and made it look worse). What a great fabric, and the border print on the sleeves is definitely noticeable. Great fit too! I adore wrap styles, and I love your dress! The colors are a bit more muted than what you usually sew, but so very flattering! Have fun on your trip and take light clothes; I bet it will still be very hot there. Have a great time on the Greek Islands - Zante (aka Zakynthos) is stunning, and at this time of year the baby turtles are hatching and making their way to the sea. Ah, GREAT idea attaching the tie at the other side!! I have some issues with the knot being heavy in my version. I actually just chopped my dress version in to a top because I was so unhappy with it. I'd like to revisit the pattern, though, and I will definitely move the tie over to the other side. Love this fabric! I love the way the border print looks made up in this pattern.I have this pattern in my stash and every time I pass it while pawing through the box, I think of you and your previous versions. This is the perfect TNT for you. It's such a great pattern. I love the fit on you! matching undies! what a win!